Is it more important for a beginner to concentrate on acquiring good form, the theories that underpin the techniques or the correct use of the body? This must all be one and even if it is difficult, one must pay attention to all these points at the beginning of practice. Should the techniques be carried out in one movement or be broken down? The whole body must move in harmony. The movement does not work if it is not continuous. It may seem simple to use one’s hands and feet together but it is a very difficult thing to do. Comprehension must not become segmentation. Wakaru must not become wakeru (this is a play on words as wakaru means ‘to understand’ and wakeru means ‘to divide’). The thought process according to how we break things down is not efficient in our endeavor to master Aikido. If you wish to learn how to ride a bike and you divide the movements in order to study them independently of one another, learning first to peddle, then to steer, then to brake, even by working very hard you will never learn to ride a bike! (laughs). The same applies to Aikido techniques. They must be carried out, studied and understood in their totality. If we learn them by breaking them down there are inevitable lags that make them inapplicable. It is a difficult method of learning that however has no alternative and must be considered ineluctable. By working in this way there are still of course always lags at the beginning but one day the body instinctively understands and finds the solution. Should aikido practice go through the stages of kotaï, jutaï, etc…? There are steps like these. But one should not be mistaken concerning the meaning of these terms. The French words are precise but limited. Kotai means solid work but it is generally interpreted as hard work. This is completely incorrect. In this solid work, Aikido must be supple. In the same way, jutai is generally translated as supple work but is not synonymous with complacency. These are stages that can be compared to calligraphy where one first learns the very precise form which makes up the base, before moving onto more fluid and purified work. It is the same with the body. At the center are the bones, then the flesh. But one does not work without the other. The fundamental basis must thus always be present even in jutai while suppleness must be present from the beginning in kotai. After that comes ryutai work and finally that of kitai where one guides the partner as soon as their intention forms. 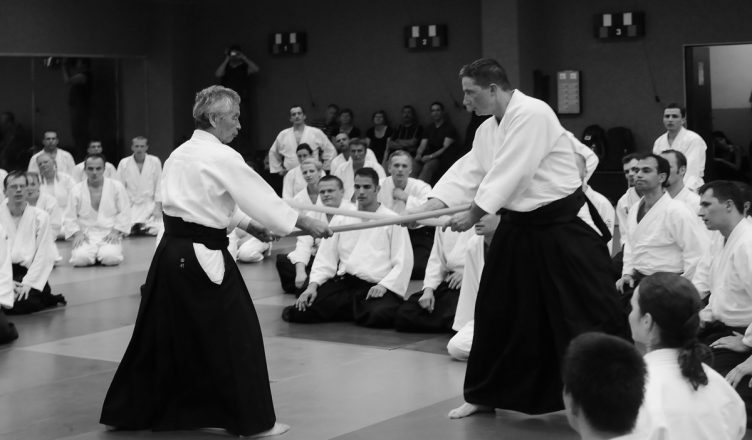 Does the concept of traditional teaching Shu Ha Ri also apply to Aikido? It applies to all traditional techniques, be that in Chado, the way of the tea, Kado, floral arrangements, etc… All these practices are studied in this way and go through these stages. In Shu one scrupulously follows the teachings of their master until one can reproduce the techniques exactly. Once one gets to that level one tries to see what such and such a change implies. One leaves the mould to continue studying. That is Ha. Finally one overcomes the contradictions and the technique becomes one’s own. This is Ri. These days people want to start with Ri! (laughs). They cannot do as the master does, so they seek another way. They cannot do one thing so they do another. In that case, it is better to do something else from the beginning. And if I correct people, they tell me that they cannot do it, that it is impossible. But it is useless to do something that you can do easily. Studying implies trying to do something that you cannot do! There is no shortcut. How was falling (ukemi) taught in Aïkikaï? In the old days in Aïkikaï, none of us were given any specific training concerning ukemi. We were all experienced in martial arts, be it in Judo, Kendo or Karate, and from the first day onwards we were thrown ruthlessly. It was thought that you learned ukemi by being thrown. You are silent when you fall, contrary to falls in Judo for example which is very loud. In Judo we are taught to diffuse the shock by falling in that manner. But in Aikido we do not assume that we are falling on a tatami. You must imagine that you are falling on stones. It is thus in order not to hurt ourselves that we must fall softly. O’Sensei regularly gave demonstrations and sometimes we had to fall on gravel. Rather than make a noise we sought to fall in a supple manner. However, when we were demonstrating on tatami we willingly made loud noises to impress the public (laughs). We generally insist on the tori’s work but rarely explain that of the uke. Ukemis and the uke’s work consist of movements that aim to protect the body. These are things that one must understand by oneself. And if one becomes good it is then possible to apply counter techniques, kaeshi waza. Are the preparation exercises that you do link to the techniques, or are they simply carried out to stretch and warm up the body? In the past, I used to start with Ame no torifune. Then there were other educative exercises like Ikkyo undo. These are movements O’Sensei used to carry out and they are perfect for young people. Children also like them a lot. Now I am older and am more sensitive to my body. I feel that it is good to do this or that exercise depending on the moment and I vary the preparation. I repeat this a lot but these are things that I discovered over time and that bring me well-being. I currently do a sort of Chinese gymnast routine that I find very interesting. I offer things to people. Each must find what suits him or her best. Exercises can be done with a view to health initially but little by little they must become a work of introspection on the body. If you truly pay attention to each movement, an exercise that you thought you did correctly will appear difficult the next day. The body is an extraordinary thing and you must learn to listen to it. When I am sitting like this (Tamura slumps down) I feel that my energy no longer flows in the right way. When I sit like this (Tamura Sensei sits correctly with superb shisei) I feel much better. The correct action is linked to a pleasant feeling. Our body carries within itself the memory of the correct posture. All that is not natural imposes constraints on the body. Positions that may seem comfortable superficially are often incorrect and do not allow the body to function naturally. The correct postures are the best for health. They do not use any force and do not tire you regardless of how long they are maintained. If your shiseï is correct then your breathing grounds itself and your body relaxes. This is why practicing kokyu ho is so important. You find the same type of study as in zazen or yoga. Budokas should have the same posture that yogis or Zen monks have. Recently, the practice of Iaïdo has grown considerably. Do you think that it helps to progress in Aikido? When I arrived in France I made people work with the bokken, jo and tanto. But by using only the bokken it is difficult to understand that this comes from the use of the sword. So at one time, I asked my students doing their shodan to know four katas from Iaido. At the time I did not know very much and injured my elbows by doing things incorrectly. Do the schools that are considered traditional such as Omori ryu, Eïshin ryu, etc… have the same practices today as in the past? It is difficult to tell. I would have liked to study under Kuroda Sensei and learned to draw my sword smoothly in one fluid and continuous movement. Not just to draw the sword but learned to use the body in its totality. Is atemi important in Aikido? O’Sensei used to say “Aikido is irimi and atemi”. But if you say this to your students the only thing they work on is irimi and atemi! People are like this. Working on atemi means that you can hit without being hit. If you carry out a technique in this way you risk taking an atemi, if you carry it out in this way you get the opportunity to hit when you want to, this is the true spirit of atemi. One day a boxer came and grabbed O’Sensei from behind. O’sensei smiled and put two fingers over the boxer’s eyes whilst laughing. Even without practice a finger can easily penetrate the eye that cannot become hard. It is by witnessing this type of scene that I understood what O’Sensei was trying to teach us. Otherwise you can miss the point and practice to hit hard using a makiwara. This is actually what we used to do at the time (laughs). What is the meaning of musubi? Aiki is musubi. It also means birth, creation. There are lots of hidden meanings and we can’t reduce it to a single word or concept. It is also the musu that we find in takemusu. It is because there is a union that something appears. It’s because man and woman unite that a child is born, that something new is created. If one considers oneself different, unique, ‘other’, nothing could be born. This is also what O’Sensei wanted to teach. He said “Ame no ukihashi ni tatete”, ‘stand on the floating bridge of heaven’. At the time we wondered what he was trying to say (laughs). Today I understand better what he wanted to say. There is a bridge between the sky and the earth that we cross and where we become the connection. Budo is a path of purification. It is misogi harai, it is not a path of destruction of the adversary. It is a path beyond victory and defeat. This is what he (O’Sensei) was trying to transmit to us in the idea of musubi. The mother protecting her child is the real symbol of ‘bu’ and has the same sense as the ‘ai’ in Aikido. It’s the absolute opposite of searching to destroy the other. Obviously, for us this was incomprehensible. Once again we were like a rabble of children from kindergarten unable to comprehend university level discussions (laughs). The ancient Mutekatsu School is known for being where the great experts practiced how to win with empty-handed techniques. With the other uchi dechis we always said that to fight muteki – without weapons – you needed and extraordinarily high level. For O’Sensei muteki signifies that we have no weapons and we are all the same. The same expression reveals a totally different meaning. Without weapons and in the spirit of brotherhood, conflict doesn’t appear and there is no winner or loser. We received an extraordinary teaching but we were blind. And we have made our students bear the weight of our ignorance! Today many forms of Aikido exist. Is this a good thing? Should O’Sensei still be the point of reference? Aikido is the creation of O’Sensei! The Shin Aikido (New Aikido), Tamura ryu (Tamura School) or others have no place. Aikido is Aikido. The work consists of finding a way to arrive at the level of practice of O’Sensei. The same cup of tea seen from the side, from above or from below has a totally different form. Today, everyone believes himself or herself to be in the right and opposed to all others because of a limited perception and in so doing goes against the teachings of O’Sensei. One should open one’s heart and see that this or that way of seeing things can also be interesting. We must not become enclosed in certainties, even if the fundamentals must always be respected. Did O’Sensei consider Aikido to be connected to other traditional ways? He never spoke explicitly of this, but he often did calligraphy. At first, I often thought that it wasn’t so great and that his characters resembled those of a child. But one day a famous master of calligraphy saw his work and exclaimed: “This is extraordinary, who has written this?” And later his writing became even more interesting. His calligraphy was very appreciated. We can see in calligraphy the heart of the writer. A true master is recognizable no matter what field he expresses himself in. If this isn’t the case, then he is an impostor (laughs). Without going so far as to say that, it seems to me that a master is revealed in the ways that he has chosen. One of the origins of Aikido is Daito Ryu. How did O’Sensei develop his practice? At the beginning, O’Sensei taught Daito ryu exactly. Then little by little his practice evolved at the same time as his vision of life took shape, surely influenced by his religious convictions. These changes didn’t happen all of a sudden, they were gradual and sometimes not even visible from the outside. His ikkyo that could have seemed identical seen from the outside was underlined with a different intent. Did you practice other martial arts before Aikido? I started Kendo at the high school with a friend of my father’s who was a teacher of Kendo and also Judo. Why and how did you start Aikido? How did you pass your days at the time? There was the morning training at 6.30am. As we slept in the dojo we had to quickly get up to put away the futons and then tidy up. We occasionally slept in and were awoken by the first students. After that there was training from 8am to 9am. Then we would have breakfast. During the day we worked and in the evenings we went back to training. And little by little the number of classes increased. I also often accompanied O’Sensei on his travels. How was O’Sensei when he traveled? Whenever we took the train, for example, we had to buy tickets. We obviously had to wait in line. But O’Sensei would leave without waiting. And of course, we had luggage with us. There were gates, but no one would stop a grandfather walking through as if there was nothing to it. I would panic and he was hard to see because he was small. Finally I would find him again and somehow we would get on the train. In Tokyo the uchi dechis had to come to fetch him when he returned. Obviously we had no way of knowing what carriage he was in. We only knew which train he would be on. We would wait at the entrance to the station and look to try and see him. Often by the time we found him he had already got into a taxi and would lecture us when we got back! Everything served as training. O’Sensei also made decisions suddenly. One day he asked me to go and fetch a taxi. So we headed off towards Shibuya because he wanted to go to a religious establishment called Korindo. The taxi driver clearly didn’t know where it was and O’Sensei got angry. Finally he recognised the path and we made it there. That day I understood that I should always educate myself as to the area we were going and the route to get there. It was a good lesson. In appearance, he walked like anyone else. But he always practiced wearing tabis on traditional tatamis. This is extremely difficult because they are very slippery. This is how he developed an extraordinary technique. With the other uchi dechis I also noticed that O’Sensei’s tabis got whiter with use at the level of the joint between the foot and the big toe. It is an area not normally worn out when people wear tabis. Did everybody wear a hakama in the past? Yes. The hakama is the practice uniform of traditional martial arts. It is used in Kendo, Kyudo, Iaido… It was used in all of these disciplines independently. It was even forbidden to practice without a hakama. Was there not even a minimum level to wear it? No. In fact it is I who am indirectly and unwillingly the cause of the fact that not everyone wears it straight from the beginning. When I was uchi deshi I was in charge of giving lessons at university. But after the war, even more so than today, students were often very poor! (laughs). Because of this some of them could not practise so I asked Kisshomaru Sensei if it was possible for them to not buy hakamas until the second year of practice. This question was discussed and the students were eventually allowed to do their first year without a hakama. The habit then spread. In Japan, university students generally practised daily and made it to 2nd kyu after a year. This is how it became mainstream. When I arrived in France I tried to make all students wear the hakama but this failed. Teachers thought that not wearing it motivated students to continue practising. I told them that if everybody wore it from the beginning this would no doubt attract more students but they were unconvinced (laughs). It is sometimes said that the folds of the hakama are linked to such and such a virtue. Did O’Sensei ever mention this? No. I never heard him speak of this. Why do we wear trousers under the hakama? I think one of the reasons is to not wear the hakama down too quickly in suwari waza. (NB : Aikido is the only major discipline where trousers are worn under the hakama. This is not done in Kendo, Kyudo, Iaido or traditional jutsu’s). Where did O’Sensei live the majority of the time when you were uchi deshi? He was everywhere! He spent a week here and a week there. When you thought he was in Tokyo he had already left for Osaka. When you thought he was in Kansai he was in Iwama, and when you thought he was in Iwama a phone call asked you to go and pick him up at the train station! He also often went to Wakayama at Hikitsuchi Michio’s place. He no doubts inherited this trait from Takeda Sokaku, who taught one week in one place and then went elsewhere. He was not the type to stay in one place. Did you ask questions to O’Sensei? As an uchi deshi, it was unthinkable to ask a question of O’Sensei. We watched as attentively as possible, absorbed his corrections and exchanged our points of view between ourselves. This is how we had to develop our techniques. Can one achieve the effectiveness of O’Sensei without going through, as he did, life or death situations? No. But if you practice to win in combat it is better to learn how to use a gun (laughs). The question is to know what we are looking for in the practice of Aikido. Didn’t you have moments where it was difficult in the old days? have to take it !” There were shops that have disappeared, at Ameyoko, at Ueno. There was a cake seller where lots of young girls worked. After New Year’s Christmas cakes were hard to sell and we would come and collect them too. It was that kind of time. At the Kuwamori dojo I heard that you were teaching 5th Dan though you were not yet a 1st Dan ? Are there things that only time can help one understand? One of O’Sensei’s students also studied the naginata. His professor was considered one of the biggest experts in the army of this weapon at that time and I was lucky enough to be invited to one of her demonstrations. She was a 75-year old grandmother. After the demonstration I had the privilege of being introduced to her. She didn’t stop talking about O’Sensei whom she admired and considered the greatest budoka. Suddenly she looked at me and asked me how old I was. I told her I was twenty and she said: “You can’t understand anything until you’re seventy”!. I told myself “how cheeky of this grandmother”. Now I know she was right! (laughs). It is said that O’Sensei only taught kaeshi wazas to uchi dechis? It wasn’t so much that as the fact that we were the only ones sufficiently trained to be able to see what he was doing. Were there still dojo yaburi (challenges)? Haga Sensei was a young and famous Kendo and Iaido Shihan. He was an exceptional master. In Japan when a museum buys a blade they make sure that it is authentic and experts are asked to test it. If this task is given to the wrong person, the sword can be irredeemably damaged. Haga Sensei did this kind of work. He was also an extreme person. During discussions about martial arts, when somebody got out of hand because they had had too much to drink he often asked them to back up their words with an actual sword! He came one day having heard of the dojo. He had not seen OSensei at training but we politely invited him to dinner. He then thought that it was not a serious dojo. He came regularly to eat when he had no money for nearly a year. One day his work forced him to move to Korea and he came to bid us farewell. OSensei then invited him to the dojo. He gave him a bokken and said: “I’ll simply walk in the dojo, hit me whenever you like”. I hear that you trained with shuriken in the past? Oh yes, that was Noro! (laughs) He was very good. He could throw with precision and from a distance. I was not aware of this but one day he asked the Doshu who at the time was a small child to serve as a target. He threw shurikens all around him but finally landed one in his leg! Moriteru then started crying but Noro asked him not to say anything and he promised that he would buy him chocolate in return. He (Moriteru) was in pain but that night when he came home he said that he had fallen. But after three days Noro still hadn’t kept his promise so Moriteru denounced him, calling him a liar (laughs). 40 years later Noro Sensei offered him a huge pile of chocolate! Recently Yamada sensei has written that you have refused the 9th Dan. What is the reason? O’Sensei had told us that Aikido was up to 8th Dan; that eight was the end of a cycle that brought us back to the beginning. Eight in Japan has a positive meaning, the ideogram being in the form of an opening. After eight we go back to the beginning. This is what he told us. And it is what I explained in turn. I was then offered the 9th Dan in Japan. That put me in an uncomfortable position (laughs). I asked them to give me this title posthumously only. Unfortunately, I put them in an uncomfortable position in return. Now it is necessary to make the practitioners who are younger than me and who would no doubt be happy to become 9th Dan wait patiently. They must be asking themselves “Why doesn’t Tamura Sempai accept this?” It’s obviously not a problem with Doshu, it’s just that it would be difficult to say to my students that this kind of thing has changed now that they’ve offered me the 9th Dan ! (laughs). The Doshu is troubled and I’m really embarrassed. I would really like that they forget this whole business. Aikido is a way that allows one to discover oneself and to construct oneself as a human being in order to live a full and happy life. My students are like my children. I hope that they are in good health and live happy lives. That they find a way to happiness and that they are able to look back on their lives when they are dying and say that it was worth it. This is what I want people to achieve by the practice of Aikido. No Replies to "Nobuyoshi Tamura; The Eagle of Aikido / 2"